The vertebrae in the spine are connected by intervertebral discs, ligaments, and okolomatocnah muscle groups. The disks are between the vertebrae are composed of cartilage, contain a nucleus and surrounding ring of connective tissue. Thanks to intervertebral discs occurs attenuation of motion in the spine, it is flexible and remains durable. Intervertebral hernia is a protrusion of the disc from an intervertebral position in the spinal canal. When this occurs, the compression of the spinal cord, its nerve roots in the intervertebral holes. All this leads to serious consequences. Indirect signs on the radiograph, indicating the loss of the intervertebral discs. Neurological alterations diagnosed during the examination with a neurologist. Local sensitivity disorders. They are the result of the compression of a nerve root emerging from the spinal canal through the intervertebral holes in the seat of hernial protrusions. Narrowing the gap leads to a narrowing of these holes, pinched nerve roots. Violations of motor activity in the lower extremities for the same reason. A decrease of tendon reflexes. 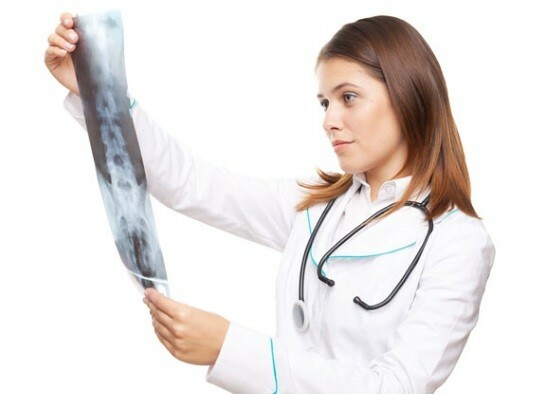 X-ray examination is the most simple and cheap method of diagnosing pathologies of the spine. However, it is not always informative enough. The most reliable method of diagnosing a hernia is an MRI. Informative and CT. These methods can be assigned to the primary, without prior radiography, or appointed after it to confirm the diagnosis. However, the ability to perform MRI and CT scans are not in any clinic. Are they only in large medical institutions and relatively large cities. In addition, they are significantly more expensive. Therefore, sometimes it is the x-ray method may be the main. A good specialist can diagnose a hernia with a high probability, given the clinical signs, indirect signs, the data of examination of the patient. Radiological signs appear in long flowing low back pain, the development of a hernia of considerable size. Unfortunately, in the early stages of change are based solely on CT and MRI. But at the beginning of the disease when complaints are still unmarked or absent, patients do not seek medical help. Only in the later stages, when the pain becomes significant, patients come to the doctor. In such cases, changes in the x-ray image is determined. In the picture are analyzed in the comparison of right and left halves of the spine, and vertebrae in particular. They should be completely symmetrical. Is determined by the distance between the vertebrae located in the neighborhood. The intensity and sharpness of their contours. The intensity of the color, the homogeneity of their bone structure. Additional growths on the bone tissue of the vertebrae. The stability of the vertebrae relative to each other. Curvature of the spine. Intervertebral hernia contributes to the development of inflammation and edema in the surrounding tissues. In addition, as the progression of a hernia is growing and pain in the spine. On the background of the phenomena surrounding the hernia muscle spazmiruyutsya. The patient also tends to take a lenient position, which will reduce the pain in the spine. The result is an uneven spasm of back muscles. Long its existence is reflected by the curvature of the spine, changing its physiological curves: the lumbar lordosis and thoracic kyphosis. Curvature of the spine seen in the photo. They can be different depending on localization of hernia. As a rule, identifies hypercity, giprogaz. Narrowing of the intervertebral gap. In the formation of a hernia is the place the destruction of the intervertebral disc. This leads to its thinning. On the x-ray picture, it looks like a decrease in intervertebral joint cracks. This symptom is specific to the hernia, however, wedge-shaped form, it acquires immediately, but at loss of the nucleus pulposus 5 mm or more. With smaller numbers, changes may not be detected, and x-ray study will be uninformative. Seal in the region of the hernia. In place of the dropped disk is the deposition of calcium, is formed by calcification that is visualized in the picture. The image formed in a lateral projection, diagnosed reduction of lordosis. In the cervical observed the sharpness of the semilunar processes, their hardening. Osteosclerotic changes of the vertebrae, growths of bone on the edge, along the front and lateral parts of the vertebrae. A hooked growth of bone tissue. These symptoms can be and spondylosis, but there is no change in the height of the intervertebral gap. What is typical for changes in osteochondrosis. Osteoporosis and osteosclerosis of the vertebrae. Increasing the transparency of the bony structures of the spine is a symptom of many pathologies. Including degenerative disc disease and the formation of a herniated disc. When performing an x-ray of the spine? A feeling of numbness in the fingers hand, feet, hip area, groin. Pain, upper, lower limbs, waist, neck, subscapular area. Periodic pain in the head. Sharp groundless changes in blood pressure. Disturbance of sensation in the extremities. pathologies of the urogenital system. Long-time x-ray was one of the main methods of diagnosing herniated discs. And today, a specialist can make an accurate diagnosis based on radiological images, patient complaints, examination. But time does not stand still. MRI allows for quick, consecutive shots-slices of the spine and soft tissues to see not only the hernial protrusion. Such images can reliably show the area of propagation of inflammation and changes of the surrounding tissues.